“Wind Chimes generate a gentle tinkling sound that reduces human stress and gives positive energy to the human. Wind Chimes usually enthral positive energy and abolish stress or mental illness. However, it is very difficult to choose the right material of Wind chimes and find the right direction or place to put windchimes." In this article, I will draw your kind attention towards the different variety of wind chimes available in the market and also help you in finding the suitable direction or place to put your Wind Chimes. There are numerous materials through which windchimes can be created like metal, wooden, ceramic, bamboo and more. So, before knowing the right place to put your windchimes in your house lets know more about the materialistic windchimes. A Metal Windchimes is usually appealed good wealth for your home and office area. They reduce or slow down the negative energy present in your building with their pleasant metal sound. Metal windchimes can be made from silver, copper, aluminium, brass, and bronze which produce pleasant and very bright sound. Metal windchimes have specialized in dropping all negative power or energy down in your building. You can also buy wind chimes online through Indian shelf and they have a wide range of wind chimes. A Metal wind chime should be put in the North, West or North West zone. These are the suitable directions to hang your metal windchimes. When you hung windchimes in West direction, it automatically enthrals good luck in the family and also helps the family member to bring honour in lives. A Bamboo wind chime produces gentle, clatter when its bamboo rods hit each other by the wind. These bamboo wind chimes bounce of bad and negative energy and create a calm environment which is filled with positive energy. When a bamboo wind chime is hung in the house it generates a sense of security in the house. Bamboo wind chimes are the ideal choice for Childs bedroom because it produces a soothing and comforting music. You can also use bamboo windchimes for hanging them outside the house or at the entrance of your home. Wooden and Bamboo windchimes are also available on different e-commerce site so, if you don't have time to visit market then order bamboo or wooden wind chimes online from the website. A Bamboo or Wooden wind chime work best in the South-Eastern, Eastern or Southern areas of your house. It is known that southeast and east directions are connected with the trees and produce a huge amount of wood energy. So, it is always recommended that put your wooden or bamboo wind chime in the southeast or east direction of your house. Ceramic wind chimes are also known as pottery wind chimes, these wind chimes are generally made from ceramic, glass or pottery. You can use these windchimes a real showpiece or an antique piece for your house. 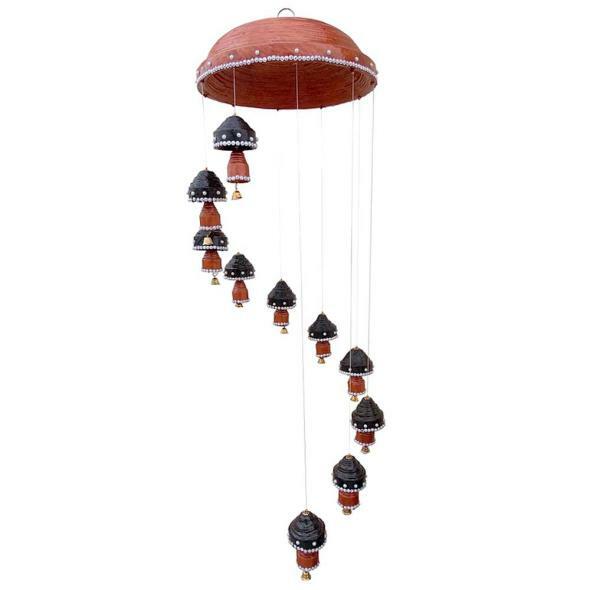 A ceramic wind chime brings love and romance luck, knowledge luck and health luck in the house. Ceramic wind chimes have different styles and they are cost effective as well. You can search ceramic wind chime on the different website and purchase wind chime online through them. The best place to put your ceramic wind chime is west, northwest, southwest and northeast area of your house. If you put ceramic wind chimes in Northeast direction then it brings Knowledge luck, if it is put in Southwest then love and romance luck is increased and if it is put in the centre then Health luck is improved. Placing or putting wind chimes of any material in the Western area of your house brings positivity in behaviour. It also influences the academic performance and health of your children. In the Northwest area of your house put hollow metal wind chimes that attract chi power. This metal wind chimes will you help to get success in your life by attracting inspirational and powerful people with its pleasant sound. Place a two rod or nine-rod wind chime in the southeast area of your house which is made of either ceramic or crystal. These wind chimes will circulate the Chi and attract more people which increase your friend circle. If you want to bring good luck in your career then put a six-rod wind chime made of a metal in the north area of your house. The north area of your house attracts water and metal and brings luck in your life. To bring wealth in your life than hang a wind chime at the end of the staircase and to attract guest or customers hang a wind chime in the middle of the entrance door. A Metal Windchimes is usually appealed good wealth for your home and office area. They reduce or slow down the negative energy present in your building with their pleasant metal sound. Metal windchimes can be made from silver, copper, aluminum, brass, and bronze which produce pleasant and very bright sound. Metal windchimes have specialized in dropping all negative power or energy down in your building. You can also buy wind chimes online through Indian shelf and they have a wide range of wind chimes. A Metal wind chime should be put in the North, West or North West zone. These are the suitable directions to hang your metal windchimes. When you hung windchimes in West direction, it automatically enthralls good luck in the family and also helps the family member to bring honor in lives. The best place to put your ceramic wind chime is west, northwest, southwest and northeast area of your house. If you put ceramic wind chimes in Northeast direction then it brings Knowledge luck, if it is put in Southwest then love and romance luck is increased and if it is put in the center then Health luck is improved. Placing or putting wind chimes of any material in the Western area of your house brings positivity in behavior. It also influences the academic performance and health of your children.